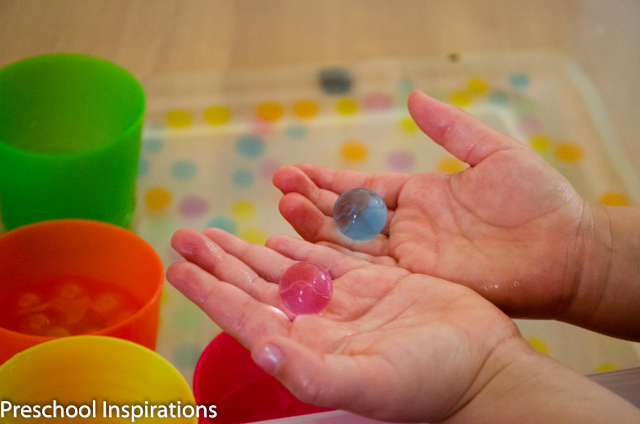 I am always trying out new sensory play ideas, and anything with water beads is a win here! I love their texture, their translucent color, and how fun they are to try and keep from slipping out of your hands. If you’ve never tried them out, they are so fun. When you’re done, you can even recycle them by putting them in the garden. I had a very sweet and generous family donate rainbow colored sensory beads to our class, and they nearly perfectly matched the cups and bowls we have from IKEA. I decided to combine math and sensory play, so that we could sort our water beads by color. It was a blast! I set this up the night before because it usually takes four hours for the water beads to grow. I just put water and the dehydrated beads in our sensory tub, then waited for the morning. Then I added the IKEA cups and watched to see how this invitation to play would unfold. My entire class enjoyed it, and many of them started sorting before I mentioned that it was an activity to match the colors. While it was my intention for them to work on sorting, I didn’t limit our play to just that. 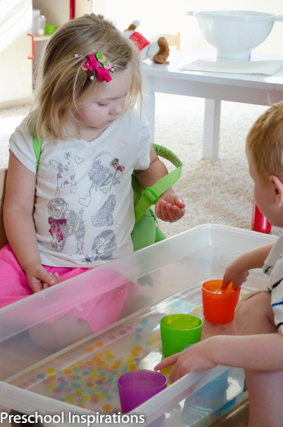 As children are learning through play all the time, I know that the skills and activities they think of are wonderful learning opportunities as well. We just used our fingers this particular time, but scoops or spoons would be a wonderful addition too. They are all perfect opportunities for fine motor practice. 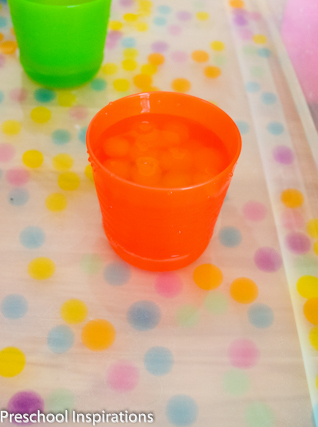 Water beads can be fragile, so the sorting element definitely prolonged our play time as the children gently placed them into the cups. 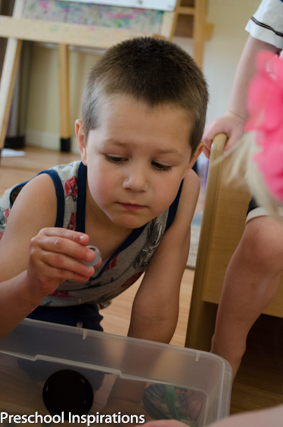 The next day’s class is younger, so our water beads didn’t stay in tact nearly as long. Squishing water beads is super fun though too. You can find water beads, also known as aqua beads, at Amazon, dollar stores, floral sections in craft stores, and some gardening stores. I know that you probably already know this, but I want to be sure to encourage everyone to always be sure to supervise children closely while using small objects as they can become a choking hazard. Water beads are non toxic, but they should not be ingested as they can cause a bowel obstruction. 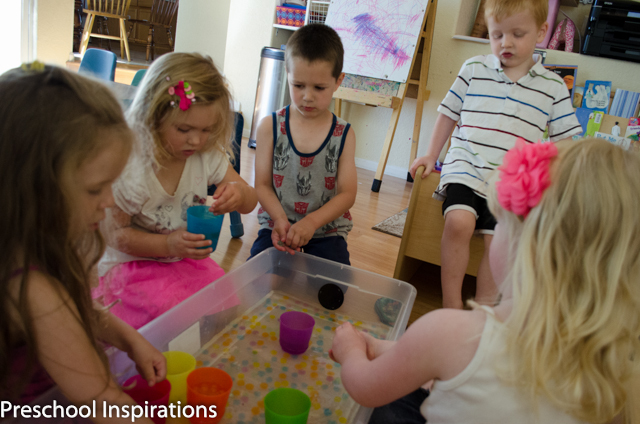 To see more exciting sensory activities, you can click on my sensory play pinterest board. This looks like fun. We haven’t really explored water beads yet. It is a blast, @JDaniel4’s Mom!!! You should try it soooon :).